But their ambitions are challenged both by the men around them and the limitations imposed on their gender—and their astronomical success could come at a price. As Mary, the world's highest paid and most beloved actress, struggles to live her life under the spotlight, she also wonders if it is possible to find love, even with the dashing actor Douglas Fairbanks. Frances, too, longs to share her life with someone. As in any good Hollywood story, dramas will play out, personalities will clash, and even the deepest friendships might be shattered. "In the era of #MeToo, Girls could not be more timely—or troubling—about the treatment of women in the workplace. Benjamin has a flair for historical fiction about women's lives.... As Hollywood preps for an Oscars season riven with the sexual mistreatment scandal, the rest of us can settle in with this rich exploration of two Hollywood friends who shaped the movies." "Melanie Benjamin, who has built an entire oeuvre out of dramatizing the lives of real historical heroines, delivers what in Variety lingo would be termed a boffo production with The Girls in the Picture, the saga of Pickford and Marion from the first flush of their friendship to its ignominious end.... One of the pleasures of The Girls in the Picture its no-males-necessary alliance of two determined females — #TimesUp before its time....Inspiration is a rare and unexpected gift in a book filled with the fluff of Hollywood, but Benjamin provides it with The Girls in the Picture." "Benjamin encores The Swans of Fifth Avenue (2016) with another glam story inspired by the legendary personalities and monkeyshines of America's film pioneers. Silent screen ingénue Mary Pickford (nee Gladys Louise Smith) and screenwriter Frances Marion meet cute on their way to becoming Hollywood A-listers—or, in Mary's case, Hollywood royalty following her marriage to Douglas Fairbanks. An assiduous researcher, Benjamin quickly gets into the heads and hearts of both women, whose professional collaboration and personal friendship over six decades are laced with delicious film trivia... A smart, fond backward glance at two trailblazers from an era when being the only woman in the room was not only the norm, but revolutionary." "Benjamin fully captures the giddy excitement of the blossoming movie business in the 1910s and 1920s and has chosen intriguingly flawed protagonists with compelling life stories that aren't widely known today. This engrossing and rewarding read provides the same mixture of well-researched plot and fascinating characters who have made Benjamin's previous novels so outstanding." "Benjamin immerses readers in the whirlwind excitement of Mary's and Frances' lives while portraying a rarely seen character, an early woman screenwriter, and deftly exploring the complexities of female friendship." "The Girls in the Picture is at its core, an empowering and fascinating tale of sisterhood. This deeply affecting story of the birth of cinema pulls back the veil of Hollywood to reveal the stories of two iconic women who played integral roles in building the entertainment industry from the ground up. Mary Pickford and Frances Marion were entrepreneurial, savvy, brilliant, courageous and vulnerable, and through their eyes we learn so much of what it took to defy the status quo and build an empire. This sublime historical fiction reads like an intimate memoir. Melanie Benjamin has resurrected these women in telling the story of their friendship. This book isn't just timely, it's necessary!" "Benjamin, known for her living, breathing portraits of famous figures, takes on The Golden Age of Hollywood, and the friendship between icons Mary Pickford and screenwriter Frances Marion. As riveting as the latest blockbuster, this is a star-studded story of female friendships, creative sparks about to ignite, and the power of women. Dazzling." "Set at the dawn of Hollywood, The Girls in the Picture explores the friendship between renowned starlet Mary Pickford and screenwriter Frances Marion. With the artistry for which she has become renowned, Melanie Benjamin has simultaneously created an insightful tale of the relationship between writer and muse and a breathtaking view into Hollywood's most glittering era. The Girls in the Picture brings readers into Hollywood the same way that The Paris Wife and Z: The Story of Zelda Fitzgerald did the Lost Generation of literary Paris&dash;it illuminates, entertains and inspires. Populated with world famous figures and enmeshed with the sexist and political complexities of the era, The Girls in the Picture is as important as it is enchanting." 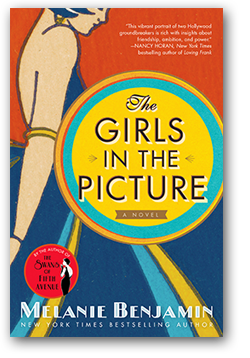 "Melanie Benjamin's The Girls in the Picture is a scintillating journey back in time to the gritty and glamorous days of old Hollywood. With elegant prose and delicious historical detail, Benjamin delivers a timely tale of female friendship—and the powerful duo who dared to dream beyond the narrow roles into which they'd been cast." "What a pleasure to plunge into the world of silent filmmaking and discover a pair of inventive women at the center of it, struggling not only to survive but to make art. This vibrant portrait of two Hollywood groundbreakers is rich with insights about friendship, ambition and power...a fascinating read." "Thrilling, bold, and incandescent, this is a deeply moving work of historical fiction about two unforgettable women whose creative partnership shaped the evolution of early American film. Melanie Benjamin is a transcendent storyteller, and with The Girls in the Picture, she has created a spellbinding novel of female power and ambition, heartbreak and desire." "Actress Mary Pickford and screenwriter Frances Marion are Hollywood legends, and I thought I knew them well—until I read The Girls in the Picture. With riveting subtlety, Melanie Benjamin reveals the texture of their daily lives and the complexity of their decades-long friendship. In the process, Benjamin creates an astonishing portrait of the early days of Hollywood, when innovation ruled and women wielded power alongside men. The Girls in the Picture is a fascinating, fast-paced, and ultimately heartbreaking story about two kindred spirits and their struggle for professional and personal fulfillment." "Melanie Benjamin has an uncanny knack for finding riveting historical characters and bringing them to life in wonderfully-rendered settings. Her many fans should get ready for the pleasure of yet another of these Benjamin miracles in The Girls in the Picture, where they'll venture into early Hollywood, the magic of 'flickers,' and women's struggles to find—and hold on to—power within that celluloid world."